Here's another post to document my stats and help me remember the numbers. It's been 5 years, 7 months since my Lap-Band surgery in October 2009 when I began at 260 lbs. I've been at/below my goal weight of 145 lbs since December 2010. I had another adjustment last Friday, May 29, 2015: the doc added 0.8cc's. Whoa, big girl fill alert! Small portions keep me satisfied for about 3-4 hours. I've also lost about 2 lbs in the last week. This is mainly due to me doing the liquid diet for 4 of the last 7 days. My choice. My doc doesn't require this. I just know from past experience this is helpful for me to ease into a new band adjustment. Also worth noting I suppose, the last time I had food come back up (a PB) was in January. 6 months ago. Having food come back up has been a rare occurrence for me in general for me in my Lap-Band journey. In my very subjective opinion, I keep my band on the looser side of the spectrum. I can eat anything I want, no food choices limit me. For example: I ate a small slice of thick crust pizza for dinner last night. Doughy. Cheesy. Took me about 25 mins to eat it, but no problems. 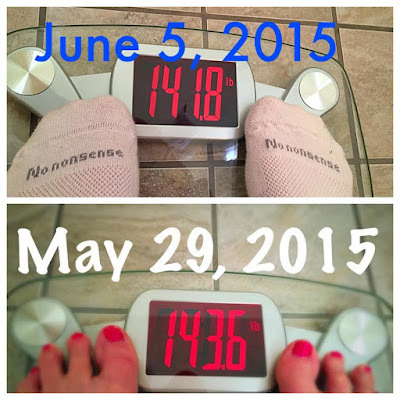 It's interesting how different a 2 lb loss on my 143lb body is compared with a 2 lb loss on my previous 260lb body. 2lbs loss now is 1.3% loss of body weight: I feel it immediately in my pants fitting better and less tummy rolls. It's so weird yet amazing! 2lbs loss when I was at 260lbs was .07% loss of body weight: didn't even notice it at all in how I felt. Maintaining my weight is an every day challenge for me. What I have learned is that it never gets any easier. Maintaining my weight is just as difficult as losing weight. But it was difficult being 260lbs too. Here's Friday weigh-ins for the last two weeks. See, I think you keep your band pretty tight, but that is only bc I regularly see what you eat and think HOW DOES SHE SURVIVE on that! lol. After my fill this week I am chilling at 7.3 cc's and although I haven't tested the pizza this week (I will tomorrow), he only only .2 ccs and LAST week I could eat a regular piece of pizza in under 5 minutes. Pretty much like a normal person, but I do like to use a fork...bc I am dainty...and a lady. And then I could eat another piece after that...but be full....for a little while! Um...have you ever taken a scale pictures in socks?